Discovery Academy is the leader in pioneering best practices for educational excellence. 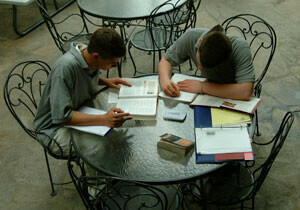 Our scheduling, curriculum, and expereinced faculty reflect our commitment to academics. Students attend classes from 3 p.m. to 9 p.m. Many educators believe this to be the optimal time for pupil learning. This schedule allows our students to participate fully in morning therapeutic exercises without sacrificing critical class time. Since we are not limited by a semester schedule, the student’s learning experience begins the day they enter our program. The student, their teachers and therapist, work together to build an academic plan that best suits that student’s unique learning style. This customizes the learning process for every child. The academic model at Discovery is built on a strong core curriculum of English, Mathematics, Science, and Social Studies. We believe students should learn for knowledge and competency. Our program also includes weekly experiential learning activities, enriching elective courses, and Advanced Placement opportunities. All Discovery Academy teachers have active teaching licenses. Many teachers have Master’s level degrees. They have an average of 15 years teaching experience. Each of these tools serves as building blocks for Academy students to transition to community college and university learning opportunities. It’s important for students and parents to realize that the struggles that made them seek help at Discovery Academy were not just troubles at school. Academy instructors and clinicians work as a team to make certain each student is progressing in a balanced manner in both school work and behavioral areas. We offer the same level of clinical care a student would receive in a residential treatment center, but with an enhanced academic component that allows students to prepare for college entrance. For more Discovery Academy educational advantages, please see the Advantages tab in the Academic section, fill out our Assessment or contact our admissions department at (801) 701-3711.